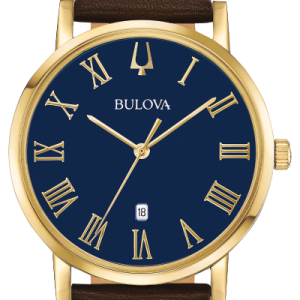 Women's Classic Watch REF 96M145 From the Classic Collection. 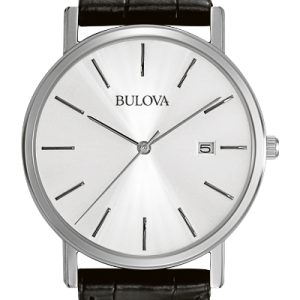 New sleek Ambassador style in stainless steel with tonneau-shape case, vertical brushed silver-white dial with Roman markers and three-hand calendar feature, domed mineral glass, stainless steel bracelet with double-press deployant buckle closure, and water resistance to 30 meters. REF #96A186 CURV From the new CURV Collection. The worlds first curved chronograph movement features high- performance quartz technology with 262 kHz vibrational frequency for precise accuracy. 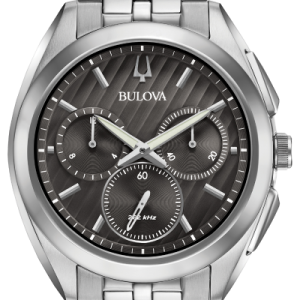 Five-hand chronograph in stainless steel case, dark grey dial, curved sapphire glass, screw-back case, stainless steel bracelet with double-press deployment closure, and water resistance to 30 meters. Men's Marine Star REF 96B287 From the Marine Star Collection. 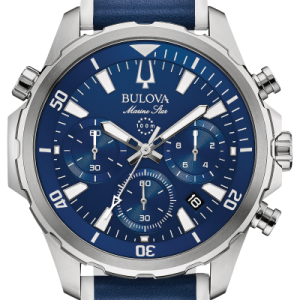 Six-hand chronograph function with calendar, stainless steel case with rotating dial ring to measure elapsed time, blue dial with silver-tone accents, flat mineral glass, screw-back case, blue leather and silicone strap with white stitch detail and three-piece buckle closure, and water resistance to 100 meters. 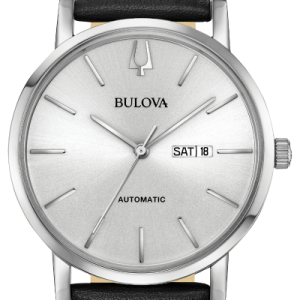 Men's Classic Automatic Watch. REF 96C130 American Clipper From the Classic Automatic Collection. New American Clipper style in stainless steel case, automatic self-winding movement with 40-hour power reserve and open case back, silver-white dial with markers and day/date feature, flat mineral glass, smooth grain black leather strap with three-piece buckle closure, and water resistance to 30 meters. Men's Classic Watch REF 97B177 American Clipper From the Classic Collection. New American Clipper slim-profile style in gold-tone stainless steel case, dark blue dial with Roman markers and date feature, flat mineral glass, smooth grain dark brown leather strap with three-piece buckle closure, and water resistance to 30 meters. 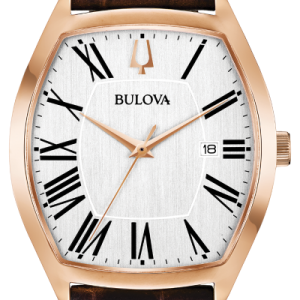 Men’s Classic Watch REF 96B104 From the Classic Collection. Silver patterned dial. Calendar. Stainless steel case. Black leather strap. Women's Classic Diamond Watch REF 96P183 From the Classic Collection New ultra-slim classic styling in stainless steel with three diamonds individually hand set on silver-white dial, mineral glass, stainless steel bracelet with double-press deployment closure, and water resistance to 30 meters. REF #98A185 CURV From the CURV Collection. The worlds first curved chronograph movement features proprietary high-performance quartz technology with 262 kHz vibrational frequency for precise accuracy. Five-hand chronograph in rose gold-tone stainless steel case and black bezel, exhibition case back, black dial with rose gold-tone hands and markers, anti-reflective curved sapphire glass, screw-back case, black EPDM rubber strap with three-piece buckle closure, and water resistance to 30 meters. Diamonds REF #98R239 CURV From the CURV Collection. 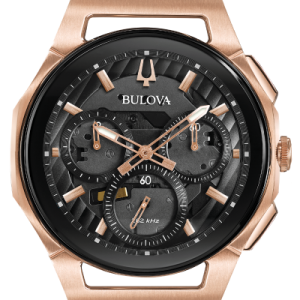 Curved case, dial and proprietary movement features high-performance quartz technology with 262 kHz vibrational frequency for precise accuracy. 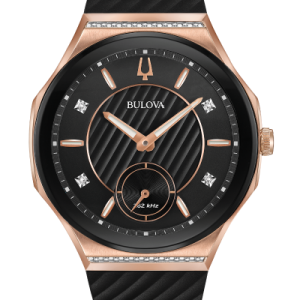 26 diamonds set on rose gold-tone stainless steel case and black dial with three-hand sub sweep, rose gold-tone hands and markers, exhibition case back, anti-reflective curved sapphire glass, screw-back case, black EPDM rubber strap with three-piece buckle closure, and water resistance to 30 meters. 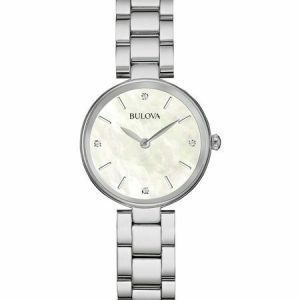 Women's Diamond Watch. 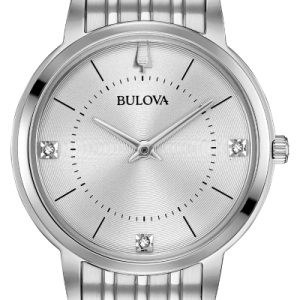 Ref 96S159 From the Bulova Diamonds collection. 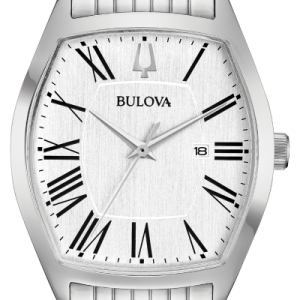 In stainless steel with 4 diamonds individually hand-set on white mother-of-pearl dial, and flat sapphire glass. Diamonds New REF #98P180 Modern From the Modern Collection. 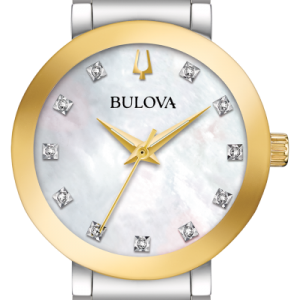 In stainless steel with gold-tone accents and 11 diamonds individually hand set on white mother-of-pearl dial, metalized edge-to-edge domed mineral crystal, screw-back case, gold-tone accented stainless bracelet with double-press deployment closure, and water resistance to 30 meters.